New to the Tudor era? 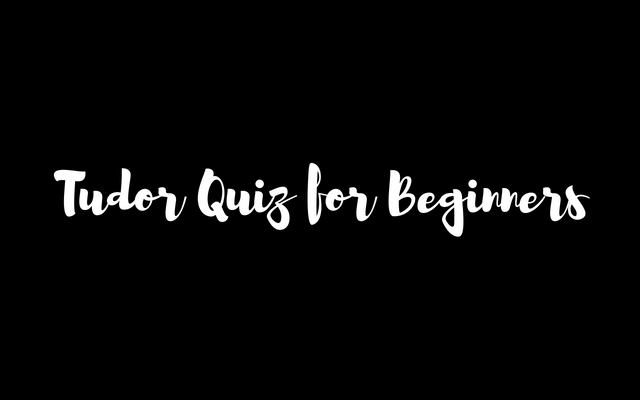 This quiz is perfect for you – this is some of the base information you should know when beginning. Who was the first Tudor monarch? Henry Tudor became King Henry VII when he defeated Richard III at the Battle of Bosworth in 1485. Henry VIII was married six times and executed two of his wives – which wives were beheaded? Anne Boleyn was executed in 1536 and Katheryn Howard in 1542. This daughter of King Edward IV married Henry VII and joined the two houses of York and Lancaster. Which of Henry VIII’s wives was he married to the longest (select one) and which was he married to for the shortest period of time (select one). Which of Henry VIII’s wives used the motto: “Bound to Obey and Serve”? Katherine of Aragon had been married to Henry’s brother Arthur until his death in 1502, and Kateryn Parr had been married twice before wedding the King. True or False? Eustace Chapuys was the French ambassador to the court of Henry VIII. Eustace Chapuys was the imperial ambassador and served the Holy Roman Emperor, Charles V.
Which two men had Henry VIII’s sister Mary been married to? Contrary to Showtime’s The Tudors, Mary wed the King of France as her first husband and then secretly wed Charles Brandon, Duke of Suffolk. How old was Edward VI when he became King of England? During the reign of Henry VII a man by the name of Perkin Warbeck claimed to be what person? Warwick claimed to be Richard, Duke of York, one of the princes in the Tower and brother to the Queen, Elizabeth of York.